The thing about exercise is that while it’s very easy to say, “I’m going to start exercising tomorrow,” following through on that promise and sticking to it for more than a few weeks is a completely different matter. It’s why the days after the New Year always see a spike in new gym memberships, only for the new members to stop showing up by February—sometimes as early as the middle of January! Bottom line? Working out is never easy. If it were, it wouldn’t be called working out. If there are days when you don’t feel like going for a run or pumping iron at your gym, don’t be too hard on yourself. It’s fine to skip a workout every now and then. In fact, spending more time recovering can actually be good for your performance and growth. However, there’s a difference between skipping the occasional exercise session and constantly procrastinating. The latter is what many people struggle with, and it happens because of a lack of motivation or willpower to put the work into getting fit and healthy. 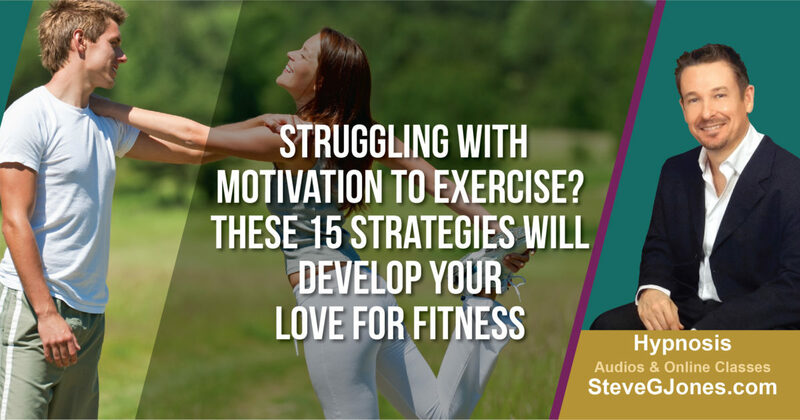 If your motivation, or lack thereof, seems to be sabotaging your efforts to exercise, try these strategies to motivate yourself. If you are still thinking like a couch potato—that is, someone who spends most of their time at home—then working out or exercising will always feel like a chore to you. Unless you change your mindset or perspective about exercise, it will be hard to find any real motivation to be active and fit. For example, if you always see exercise as being too difficult because of your very busy lifestyle, try to look at things under a new light. You could think of exercising as an investment in yourself, similar to how people buy life insurance and health insurance. Try to see exercise as a way of improving your quality of life, making you not just look on the good on the outside, but actually feel good despite your hectic lifestyle. If you’re a parent, you can exercise as a way to set a better example for your kids. Different people have different ways of blowing off steam. For some people, it could be a weekly appointment at the spa. For others, it’s curling up on the couch to read a good book or playing an engaging video game. You can use exercise as your personal time, a chance to put your mind on a mental vacation and get away from the stress of daily life. If you think of working out this way, it will seem like a treat instead of a chore. With this mindset, you can go to the gym or go for a run with the approach of working hard to feel better inside and out. This little shift will help you focus on your workout instead of begging for it to be finally over. Nike’s famous slogan couldn’t be more appropriate for anyone looking to get fit and healthy. One of the best ways to motivate yourself to start exercising today is to stop thinking about and just do it instead. Take action instead of overthinking how and when you’re going to start exercising. The more time you have between thinking about it and doing it, the more likely you’re going to overthink your way out of exercising. The same principle applies on those days when you don’t feel like going to the gym or going on a run. Just pack your clothes and go to the gym. Chances are, you’ll have a change of heart when you get there. 4. Put Your Money Where Your Mouth Is? Some people may not have the motivation to exercise, but they might be more motivated by other things. For example, many people are motivated to do things out of a desire to save money. If this sounds like you, what might work wonders for your exercise motivation is to enroll in a gym or non-refundable workout class. This works especially well when you’re struggling to get out of bed for an early morning workout. Because you’ve already paid for a gym membership or group class, you’ll feel compelled to get the most out of your hard-earned money. Most people have the same set of reasons for wanting to exercise: to be healthier, lose weight, have a smaller waistline, and gain muscle being among the most common. But try to go deeper or be more specific. For example, if you’ve always wanted to run a full marathon, set your exercise goals on running your first 5K, 10K, 21K, and a full marathon within a specific timeframe. Better yet, sign up for a marathon early on so you can put yourself on a clock. But whatever exercise and fitness goals you set, make sure they are realistic. Yes, eyeing a full marathon is a worthwhile goal. But aiming to do it in less than two months isn’t exactly realistic, even for seasoned runners who have taken a few months away from running. Whether you exercise before sunrise or a few hours before going to bed, what’s important is working out on a regular schedule. The trick is finding a realistic way to weave regular exercise into your daily routine of work, family time, and personal time. Most people assume that getting real results in the gym means spending upwards of two hours running and lifting weights. But the truth is that unless you’re a professional athlete or bodybuilder, there’s no reason you can’t get a full workout done in 45 to 60 minutes. In other words, all you need is one hour dedicated to exercise each day. And when you make exercise a part of your regular schedule, it becomes easier to adjust activities and events around it, instead of the other way around, which is what happens with most people. Working out doesn’t have to be serious and repetitive. There are countless ways to exercise and break a sweat. So don’t be afraid to find the routine or program that gives you the most fun while working hard. Whether it’s a spinning class, a Zumba group workout, or a weekly run out in the trails of your city, feel free to diversify your exercise strategies. Do what gives you the most fun so your motivation to do it stays high all year round. For example, people who love to dance will always work harder and longer in a dance class than they would in a running class. That means having fun can make reaching your fitness goals much faster. Mixing things up also ensures you are constantly challenging your body to adapt to new workout routines. If you’ve been lifting weights for the last six months and feel your performance has reached a plateau, join a yoga class to challenge your flexibility, which in turn, can improve your weight lifting performance. It’s much easier to stick to a workout program or exercise regimen when you have someone to motivate you and motivate in return. Whether it’s a friend, your spouse, or even your entire family, support groups are a powerful way to sustain your motivation for exercise, or any other endeavor for that matter. When you’re on your own, there will always be days when you just don’t feel like getting out of bed to go to the gym or local park for a run. So, you procrastinate and promise to do it tomorrow. But having someone who can push you to go out and get the work done means you can stick to your goals and eliminate procrastination, even when your mind doesn’t want to. Having a support group can be as simple as joining a Facebook group of fitness and nutrition experts, where you can share insights and tips on how to lose weight or prepare healthy meals. You can also try joining group classes, which prevent you from getting bored with your exercise program. One way to maintain your motivation to exercise is to make sure your fitness gear is always visible or within reach. When you wake up and see your sneakers, dumbbells, yoga mat, or workout clothes by the dresser, you’ll never be able to get exercise out of your mind. These little visual cues are a powerful way to sustain your motivation, reminding your brain just how much you need to exercise even when you don’t want to. If you have no one to remind you to exercise, let your gear do it for you. If you don’t want your gear to mess your home décor, just pick one or two places where you spend a lot of time and can use your fitness equipment. It can be a yoga mat near the television, resistance bands inside your closet or a pull-up bar hung behind your bedroom door. When you work out for, say, a few months, it can be hard to see any noticeable results in your physique. Relying on a weighing scale may seem enough, but your weight is just a number. If you exercise consistently, you may even end up gaining weight by putting on muscle but still have a smaller waistline. Muscle is much denser than fat, so it weighs more by volume. The most reliable way to monitor your progress—aside from periodically taking measurements of your waist, arms, and thighs—is to take pictures of yourself every few weeks or so. When you compare how you look now to how you looked when you first started out, the subtle changes in your body are a powerful motivator to keep pushing forward. Finally seeing results from working out can give you a powerful motivation boost, encouraging you to stick to your workout schedule and work harder than ever before. But what happens when progress becomes slower and you hit a dreaded plateau? When you reach this point, don’t let it shake your confidence. Trust the process. Continue to work out, eat well, and get enough rest. At some point, your fitness progress will slow down to a crawl—but that doesn’t change the fact that its’s still progress. Stick to your guns and focus on the results to fuel your motivation. Let’s face it, there will always be days when work or other obligations get in the way of your exercise activities. If you have no choice but to skip your usual run or cardio workout, turn your regular commute into a fitness routine instead. Biking, running, or walking to and from work is a great way to hit two birds with one stone. For one, your commute is a normal part of your day, so you won’t need to set aside any serious amount of time just to exercise. Of course, the logistics of commuting on foot or on a bicycle can be tricky depending on your work situation or availability of public transportation. Assess your situation first to figure out how to safely run or bicycle to and from work. You can try carpooling to the office and running back home, or investing in a bike if you can shower in the office. There is something satisfying about keeping a log of your exercise efforts and looking back to see you how far you’ve come. The act of writing down your workouts or miles run can be enough to make you keep pushing yourself, motivating you not to break your streak of progress. You can even share your journal or workout videos on social media, where your friends can cheer you on and fuel your motivation. With this approach, your online contacts can hold you accountable and push you to keep at it. A study in the Journal of Experimental Social Psychology suggests that clothing can influence your attitude and behavior because of its symbolic meaning. In the context of exercise, the clothes you wear can motivate you to work harder and longer. When you wear fun or flattering workout gear, you become more confident and feel good about yourself. This can be a powerful motivator when you’re in the gym. If you occasionally treat yourself to new fitness clothes, you will likely find any excuse to wear them. In turn, this makes going to the gym an activity you actually look forward to instead of it being a chore. And because quality exercise clothes not only look good but feel good, you’ll have a better time working out hard without feeling sticky or stuffy in your outfit. Note that stylish exercise clothes need not be expensive. If you use them as occasional treats, your new fitness wardrobe won’t have to break your bank. Why do some people seem to never run out of motivation? How do they maintain the discipline to wake up before sunrise and go to the gym or for a run? The answer lies in how they think, which is where therapies come in. Whether it’s behavioral therapy, cognitive therapy, or hypnotherapy, addressing the thoughts and feelings you associate with exercise can be an effective way to go to the source of your motivational challenges. Hypnosis, in particular, offers a high potential of helping you develop your motivation and discipline naturally. According to a 2014 study published in the Complementary Therapies in Medicine, hypnosis was more effective than nicotine replacement therapy (NRT) in helping smokers stop smoking and sustaining their smoking abstinence. By focusing on your subconscious, hypnotherapy changes the very way your mind sees exercise and food. Your hypnotherapist can help you view exercise as a treat for yourself instead of a chore, and food as fuel rather than a reward. How you cultivate a positive attitude about exercise and fitness is entirely up to you. The trick lies in seeing exercise as a blessing rather than on obligation or sacrifice. Remember, there are no right or wrong methods here—people are motivated in a variety of ways. You try to combine these strategies to fuel your motivation and ensure you reach your fitness goals at your own pace. P.S. Here is a free hypnosis session for exercise motivation. It not contain music or binaural tones (my enhanced “I love to Exercise” hypnosis mp3 does).